Claire Domitric. Long Beach. 2012.
acrylic paint on wood. 6 x 12 in. 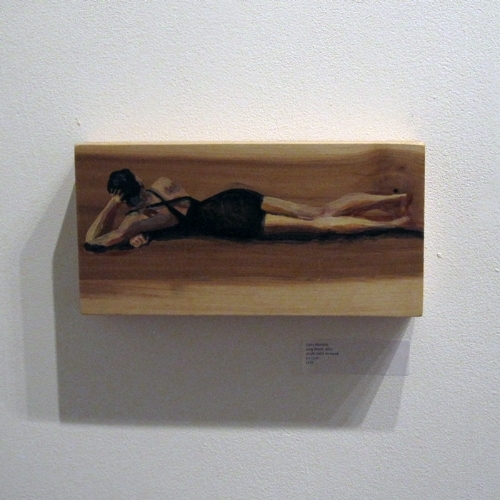 The painting, Long Beach, exists as one of a series of paintings on wood that I am currently working on in my studio. The inspiration for my art sometimes springs from the materials I choose to use. The pattern and colour of the wood grain remind me of sand and water. I challenge myself to paint using a limited colour palette and to leave most of the wood bare allowing the wood grain to suggest a sense of place. I endeavor to create a scene that does not exist in reality and at the same time sparks the viewers’ interest by generating questions, emotions and memories.